An elderly couple burnt to death after bandits broke into their home at Good Hope, East Bank Essequibo around 11 pm on Sunday and set it alight. Reports are that Mohamed Munir, 75, and his wife, Jamilla Munir, 70, who were popular rice farmers, were secured in their bedroom in the heavily grilled house. Residents who were at the scene told Stabroek News that the bandits scaled the veranda and cut the grill before smashing their way in through a glass door. After they were unable to gain entry to the Munirs’ bedroom, the bandits apparently poured gasoline and lit a fire in front of the couple’s bedroom. Neighbours said they were alerted by loud screams from the couple and the sound of gas bottles exploding. 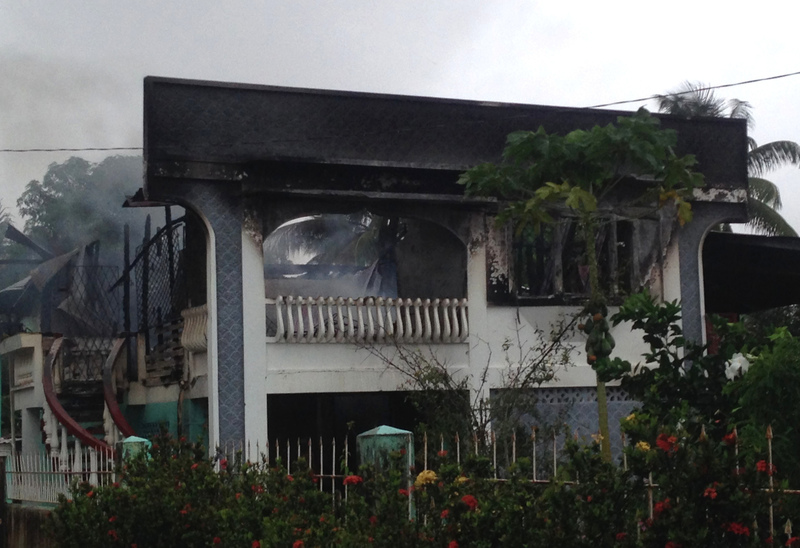 A relative told Stabroek News that before the building was engulfed, he heard Munir shouting for him and his family. Some residents also said the man had phoned them and told them that bandits had invaded his property. He reportedly told someone to “save the two tractors” and residents drove them out of the yard. His Toyota Surf that was parked under the house was destroyed. But they did not hear her for too long and assumed that she had probably collapsed before her husband, from the intense heat. As they were going they heard what sounded like two gunshots coming from the house. One man said he sought cover behind an electricity pole, while another ran into a neighbour’s yard. Another resident also fired a few shots. While it is not clear if the bandits were seen, residents said they must have escaped through the old road at the back. A crowd quickly gathered at the scene. Residents said they saw Munir standing at a grilled bedroom window and he was speaking to them. He put his hands out and called for help. Then suddenly they could no longer see or hear him. Apart from the heavy grilles preventing the couple from escaping and the residents from rescuing them, the heat and smoke was too much. One resident said he even started suffocating. When Stabroek News revisited the scene later yesterday, a relative said she was haunted by the sound of them pleading for help. The woman recalled that at first when they heard the screaming there were sounds of glass being smashed. They were not sure where the sounds were coming from and thought people were fighting. Meanwhile, residents also blasted the Guyana Fire Service because the fire tender, which arrived at the scene about one hour later, had no water. It accessed water that was available in a nearby drain but that was quickly exhausted. However, they praised the firefighters for saving a neighbouring building, which was badly scorched on one side. The guttering was also damaged. The occupants of that building said they grabbed a few belongings and ran out of the house but in their panicked state they could not immediately find the key to the gate. Dharamkumar Seeraj, who was at the scene, told this newspaper that he had known the couple for over 25 years and that the rice industry has lost two stalwarts. She was also a member of the general council of the RPA and would have contributed to the management of the RPA, Seeraj said, adding that she was well-known throughout the country by rice farmers and will be missed in the industry. According to him, it is very sad that the bandits would burn them to death because they could not get what they wanted. Relatives also said that Munir operated the tractors in the rice fields and that when Jamilla was not busy with rice she would take care of her creole fowls and flower plants. They also recalled that whenever she returned from her visits overseas she would distribute parcels to the neighbours and candies to the children. She was also remembered for sharing mangoes and other fruits from her yard. The police said in a press release yesterday that the origin of the fire was unknown, but that the Munirs’ house was destroyed and that the charred remains of Mohamed and Bibi Jamila Munir were found among the debris after the fire was extinguished. Investigations are in progress, the release said.